Mammals including the human beings are capable of maintaining their body temperature, irrespective of the nature of surrounding environmental conditions. Thus, the humans exhibit the temperature constantly in the range of 36.9F-37.5F or between 98.4C-99.5C. Although the average/standard human body temperature is subject to change marginally with the change in kind of intake of food, volume of exercise and thermal reading of the envelope of atmosphere, surrounding your place of residence, yet it tends to remain in between the two ends of the ranges only. Common Fever means that the body temperature doesn’t fall in between the normal temperature ranges, which is also an indication of the malfunctioning of body systems. The indisposition is considered the part of normal routine of lives by many people all across the globe, hence the name Common Fever. Both the adults and children are vulnerable to common fever, irrespective of the fact that the common fever is not given due emphasis and importance, yet it can prove fatal, as most of the common fever can be dengue fever, malaria, typhoid, hepatitis (including its various stages), Kala azar, Cholangitis or Septicemia. So read on further to know various causes and symptoms of it, together with various natural home remedies for common fever. Normally the body’s temperature ranges in between the normal range of either temperature scales, i.e. Fahrenheit or Celsius. But when an outside agent enters the body, resulting in the build-up of morbid matter inside the body, either due to contaminated food habits or living at unsanitary place, the body responds back in an attempt to counter check the adverse influence of same, by triggering its defense mechanism. When the body battles with the infection, it results in rise in the body temperature automatically, leading to common fever. • On account of other diseases like flu, common cold, typhoid, cholera etc. One of the simplest and inexpensive natural home remedies for common fever includes in taking the broth of holy basil leaves once a day, formed by boiling approx 12 grams of it, in half liter of water. Saffron too can be employed, by taking half a tablespoon of it, in 30 ml of water, followed by boiling. Thereafter, you can use it to make the tea, which should be given to the patient after every one hour. A cup of tea prepared with fenugreek seeds is also one of the natural home remedies for common fever, which not only gives you relief from the common fever, but also goes a long way in breaking accumulated mucus in the chest region, into pieces. You can further use raisins in curing common fever, by taking 25 of it, and immersing them in half a cup of water. Once soaked in it, just crumble them in the same water. Filter the mixture and add half a tablespoon of lime juice, and make a habit of drinking it twice a day, to make most of one of the brilliant natural home remedies for common fever. Mix a tablespoon of glucose or honey to the fresh juice of apricot, which not only will help you to beat common fever, but will also fulfill the liquid needs of your body, thereby removing baleful products from the body. Grapefruit juice also constitutes one of the natural home remedies for common fever, which should be consumed. To utilize it, take half a glass of grapefruit juice, and add equal amount of water to make the mixture, which should be taken in, on daily basis once a day, to get some relief from the burning sensation. Increase the consumption of oranges in your diet, as the fruit is considered to have the positive influence on the immune system of the body, ultimately leading to enhanced resistance of it against harmful substances. Additionally it also increases the energy level of the body. Another way to overcome common fever is to boil a cup of water, and add 1 tablespoon of turmeric powder, few ginger segments, onion pieces, lemon grass, half tablespoon of black pepper and 5-6 holy basil leaves. Take in mixture thrice a day. Make the juice using the foliage of tamarind, with some turmeric powder and cold water, and you can put to good use of the natural home remedies for common fever, which will let you, throw out both the infection and fever. To 1 tablespoon of honey, add few drops of lime and ginger juice, to make the very effective remedy for common fever. Bloodwort or hog weed herb’s infusion can be prepared by using any of the herb, by taking 15 grams of it in 20 ml. of water, and followed by boiling, can give comfort, as it induces the perspiration, leading to the removal of contagion. Go for easy to digest food, as you certainly want your body to focus on recovering rather than assimilating food. Such foods include boiled eggs, steamed vegetables, porridge etc. Avoid tea, coffee, pickles, refined and processed foods, white flour and sugar, and products made from them. 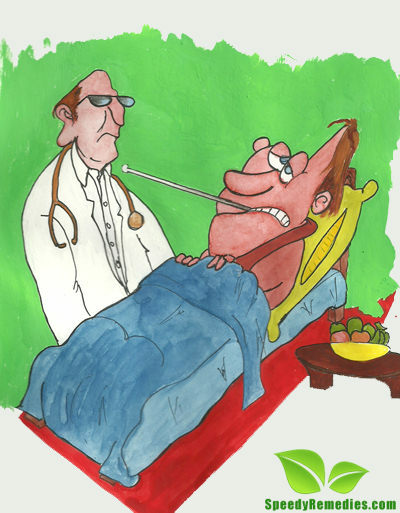 Abstain from fried, raw and junk food, to get well soon. Drink lots of water with fresh fruit juices, to overcome fever speedily. You can continue with the practice, even after getting well, to work for good health.